Yesterday we attended Kumulani Chapel on the Westside of Maui. We have heard back in April that Ricky is back on Maui and back to being pastor at Kumulani. We wanted to visit and welcome him back but we did not get a chance until yesterday. We have a long history with Kumulani Chapel, especially it's Pastor Ricky Ryan. I met Ricky way back in the '80's, back in the Philippines ('87) when I was working at A New Beginning with Greg Laurie and Harvest Christian Fellowship with Dain Wadley. Bradley on the other hand knew Ricky in the late '80's because he was then his pastor at Kumulani Chapel here on Maui. Stevo, one of the elders at Kumulani, was the one who shared about Jesus Christ to Bradley. 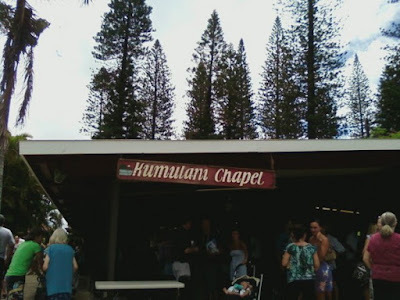 Bradley's first church when he became a Christian was Kumulani Chapel. Ricky is the pastor who "dunked" him in the ocean (yes, I meant "baptized" him :) ). The first mission trip in which Bradley went to the Philippines was led by Ricky Ryan. Bradley and I did not meet at the time. We met on the second mission trip that he went to, which was with our current pastor Craig Englert. And to make that long story short, Bradley and I met and now we are are married (17 years...). Back to Ricky.... Ricky Ryan is the most enthusiastic, most encouraging person you (we) can ever meet. But it's not fake or weird enthusiasm ... like saying Praise the Lord all the time and pretending everything is and will be hanky dory kinda of thing. His is authentic - something that springs out of the abundance of his heart. I think he has this gift of encouragement, that when he talks to people he touches them (us) to the core of their (our) hearts and meet their (our) needs without him even knowing what they are. Anyway, enough of the intro and let me move forward. The text of his Bible teaching that day was Philippians 3:12-15 (verse written on top of this post). Bradley and I needed to hear those words in all its angles. Every word that was spoken during that teaching seems to be directed to both of us. Amazing how that happens. The whole day yesterday, that Philippians 3:12-15 was in my heart and mind and I think it'll be there for a while. It'll keep me going and moving forward in this race of life. *** The podcast is now available. Go to Kumulani Chapel Website. Look for the tab SERMONS (upper right hand corner) and in the you will find the teaching on "Don't Look Back". Liza - this is one of my favorite scriptures. Many time I repeat it. Going forward and not looking back. Liza, Glad I found you. Found your blog by googling "working christian mom." You are a kindred spirit, and I share your concern to reach out to working Christian women. God bless, and please come visit my blog!